We love food. One thing we always look forward to the opportunity to sample all different types of food from around the world. The first thing you think of when you hear the words “American food” is usually hamburger. And what better place to search for the best burger joint than Los Angeles; the mecca of where new trends are born. So on my recent road trip to southern California, I decided to visit and sample the burgers from some of the best that Los Angeles has to offer. The only caveat is that the restaurant must originate from within Los Angeles and must not have any other locations outside the United States (Sorry McDonalds and Fat Burger lovers). When it comes to the topic of the best burger joint, it always seem to spark a huge debate. Locals have their favorites. Burger connoisseurs have their picks. But which one is the best? 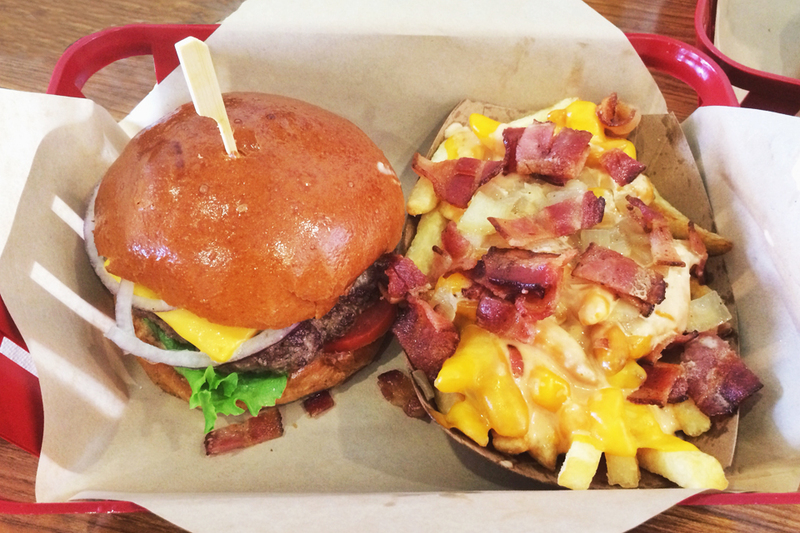 Without further ado, here are the top burger spots in LA. Who doesn’t like a slab of hot chili on their burger or hot dog? I know just the words of chili cheese fries makes my mouth water. The Original Tommy’s was first opened in 1946 and is known for their all-beef chili on your choice of burgers or hot dogs. 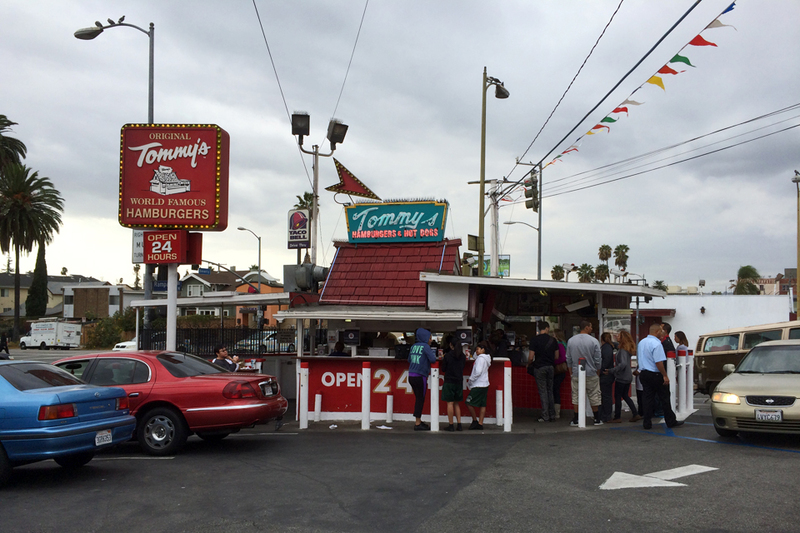 What began as just a nondescript little shack on the corner of Beverly and Rampart Boulevard, Tommy’s has expanded to over 30 locations throughout Southern California and Nevada. 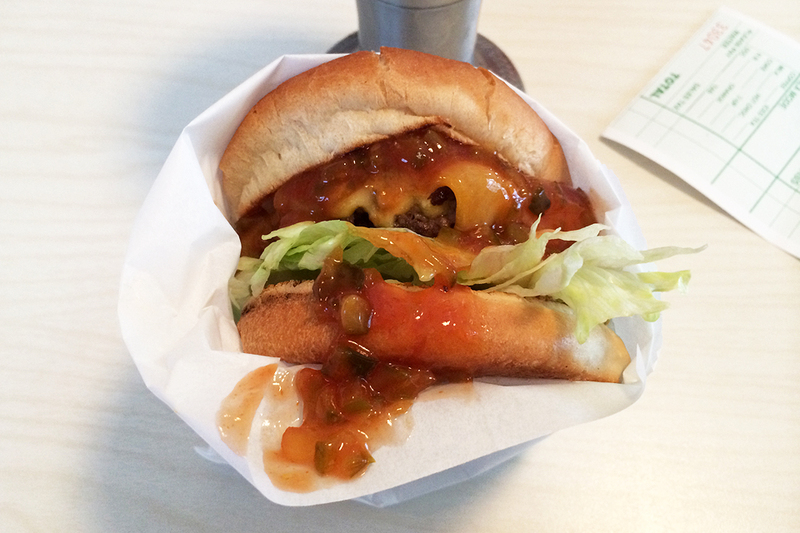 The burgers are made with all-beef patties, chopped onions, pickles, tomatoes and topped with their famous chili. Even after 65 years, the original shack still stands and people are still lining up to get into the parking lot for some good old comfort food. Fun fact, the American drama series, The Shield, took place in this very neighborhood. Don’t expect the burgers to be out of this world. It is a fast food chain after all, with the burger ready almost as fast as your order it. While the thin beef patties are lightly seasoned, the chili makes up for it. For the price of just $1.85 for a regular hamburger topped with chili, your wallet will thank you. Throw in the fact that it is open 24 hours a day, there is never a need to second guess yourself. A double cheeseburger with fries and a large drink (pictured below) will run you $5.35. Make sure to ask for extra chili at no additional cost. Opened in 1947, The Apple Pan is known for their signature U-shaped counter, burgers, pies and occasional celebrity sightings. The Apple Pan is at the top of nearly every “best burger” list that I’ve came across on the web and was recently given the title of the “Best Burger In America” by National Geographic. Not just in LA, but in the entire America. Quite frankly, I have never heard of this place until I decided to do this challenge, but I had to try it for myself to see what all the fuzz is about. There are only two burgers on the menu: the Steakburger and the Hickoryburger. Both burgers are served with juicy sirloin meat, smothered in The Apple Pan’s signature sauces topped with mayo, pickles, lettuce and melted Tillamook Cheddar cheese, nestled between slightly toasted buns. Overall, the burger was not bad, but not great. The pickle relish overpowered the juicy meat, therefore masking the taste of the sirloin. Be prepared for a glacier size amount of iceberg lettuce with your burger. Was it worth the $7.10? Not really. Maybe if you catch a glimpse of the usual celebrities like Julia Roberts or The Jonas Brothers it would justify the cost. Technically opened in 1953, Father’s Office was bought out and transformed from a small bar into a gastropub in 2000. There is only one burger on the menu: The Office Burger. It is comprised of a patty of fine dry-aged beef topped with caramelized onions, Gruyère and Maytag cheeses, applewood-smoked bacon compote and arugula served on a soft roll. Esquire Magazine called the Office Burger one of the best burgers in the world. Father’s Office is infamous for allowing no substitutions or alterations of any type on any of its dishes, including no ketchup. The Office Burger was delicious. The thick, juicy cut of beef was bursting with flavor that was further accentuated with caramelized onion. 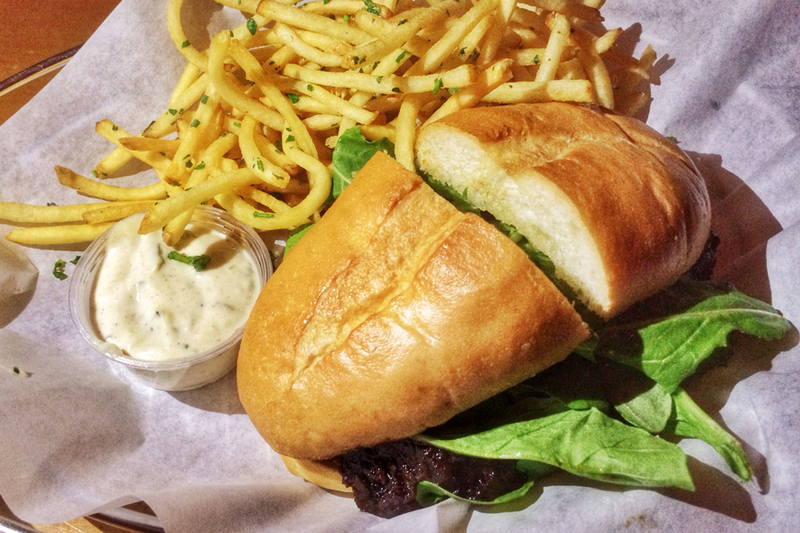 The only downside is that the beef is sandwiched between huge pieces of arugula and roll. There is simply too much bread! While $12.50 is fitting for a “gourmet” burger. Can this burger be considered one of the best burgers in the world? Hardly. Father’s Office is, however, a great place to grab a beer and watch the game in it’s dim light bar atmosphere. 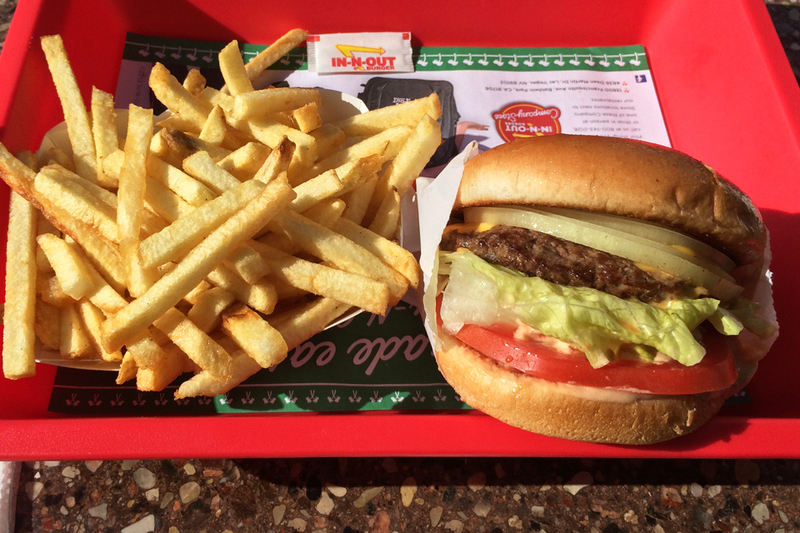 In-N-Out has been a staple of Southern California for 65 years and for good reason. Their burgers are flat-out deeee-lish! A road trip to Los Angeles is not complete without a quick dash to the city of Baldwin Park. The very first In-N-Out restaurant opened in 1948 in Baldwin Park, but was later demolished to give way for the construction of Interstate 10. A new restaurant was built near the original location. – In-N-Out was the first fast food chain to have a drive-thru in California. – Did you know that the headquarters of the restaurant is also in Baldwin Park? 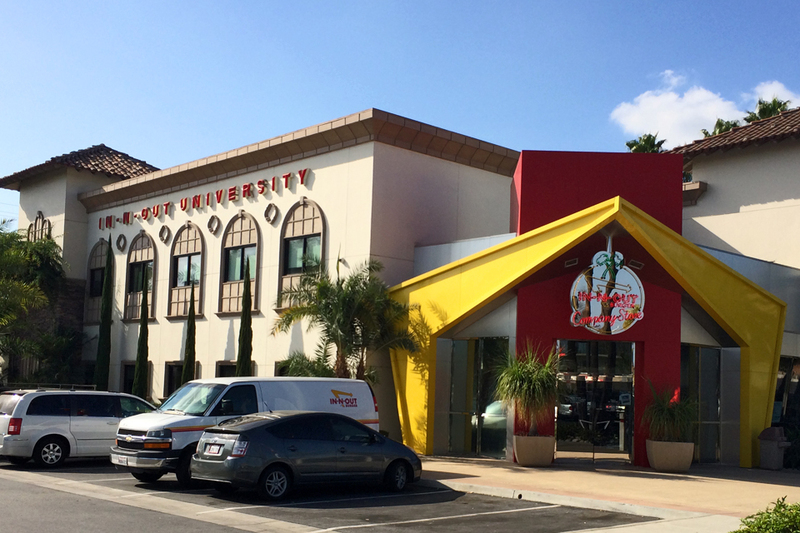 In fact, the headquarters is in the same parking lot along with the In-N-Out University where they train management positions. Their burgers are served with juicy all-beef patties, fresh lettuce, onions, tomatoes, American cheese and their signature Thousand Island like spread in between toasted buns. Yum! For a fast food restaurant, the quality and freshness of the burgers are at a premium. If you have never tried In-N-Out before, this place is a must. Their patties are not the thickest, but packed with flavor. You can always add more patties and customize your burger the way you want if you know the “Secret Menu“. Burger City Grill (BCG) opened its doors in 2011, thereby making it relatively new in comparison to the other burger joints on this list. The burgers are prepared in a gourmet style, but in a fast food diner environment. Each burger can be customized with delicious certified angus beef sandwiched between toasted brioche bun. You can choose from American, Cheddar, Swiss, Pepper Jack, Provolone, and Bleu cheese. You also have the options of applewood smoked bacon, caramelized onions, fresh avocado, homemade guacamole, hand-sliced mushrooms, seasoned pineapple, grilled jalapeno, Angus beef chili, and pastrami as toppings to choose from. Chase your meal down with their ice cold beer on tap or ice cream milkshake. Burger City Grill is hands down, the best bang for your burger bucks. A regular BCG burger (pictured below) costs $4.50 with cheese. The burgers are delicious when customized with thick juicy slices of Angus beef cooked with a smattering of seasoning. The sweet, soft and fluffy brioche bun is a terrific compliment to the angus beef. Together, the bun and the patty make a winning combination. The first Umami Burger opened in 2009 with the goal of getting the most umami flavor into a burger. Umami is a Japanese word meaning pleasant savory taste, one of the five basic taste (along with sweet, sour, bitter, and salty), a taste that is often said to be missing in American fast food. Each dish is heavily influenced by Japanese preparation methods. Methods which enhance the flavor using umami-rich ingredients such as Shiitake mushroom, seaweed, tamari, and miso. 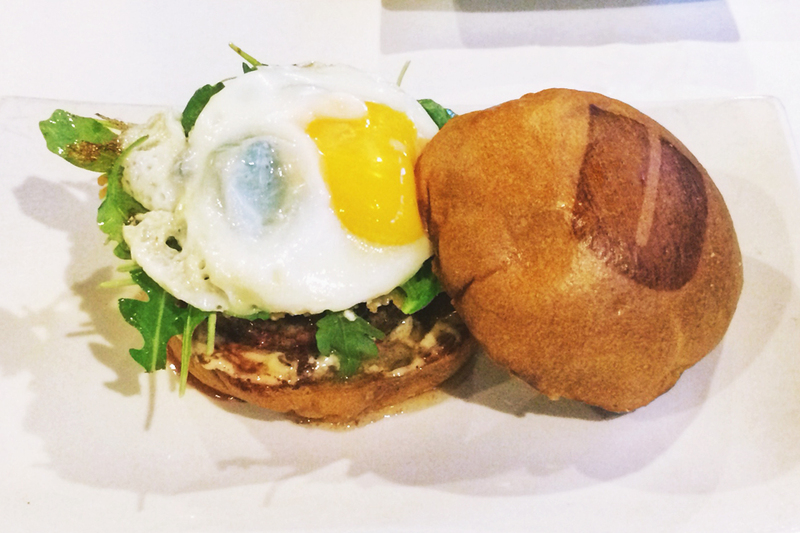 Umami Burger uses American Wagyu beef on their signature Portuguese-style bun with a perfect bun-to-burger ratio. The Umami Truffle Special was one of the juiciest burgers I’ve tasted. The fluffy Portuguese-style bun soaks up the juice and flavor from the 6 ounce beef for a mouth-watering bite each and every time. For $13, it’s not the cheapeast option, but definitely worth every penny. Is one of your favorite restaurants missing from the list? Got a restaurant we should try? 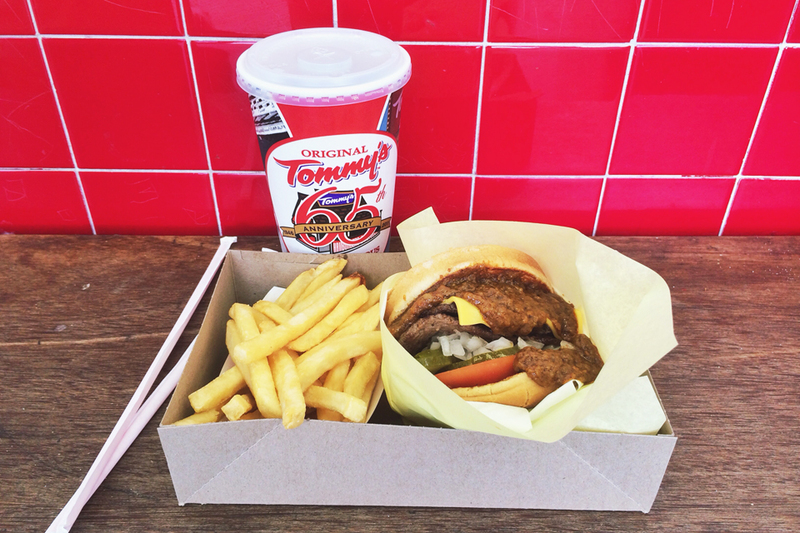 Let us know what your favorite burger joint in Los Angeles is.